The villas are fully furnished to 4 star Hotel standards each with contemporary design and Junkers wooden flooring. There is an open plan living/dining room with TV and Hi-fi system. The modern fully fitted kitchens have a washing machine, dishwasher, oven, hob and microwave. All delph and cutlery are provided. The Master Bedroom is en-suite and beds are fully dressed and towels are provided. The villas have a patio area with a picnic table and an open plan garden. There is parking outside the villas. 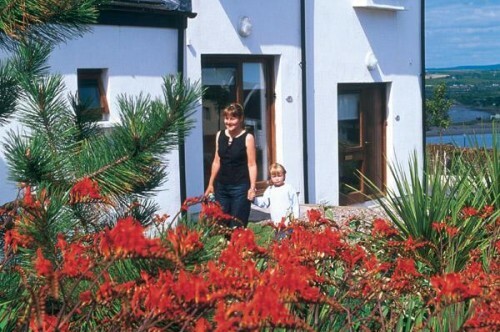 These modern apartments have uninterrupted views overlooking the sea and Youghal Bay. Each apartment is fully furnished to 4 star Hotel standards each with contemporary design and Junkers wooden flooring. There is an open plan living/dining room with TV and Hi-fi system. The modern fully fitted kitchens have a washing machine, dishwasher, oven, hob and microwave. It leads on to a balcony with sea views. The master bedroom has a shower ensuite. The second bedroom has 2 single beds and the main bathroom has a Jacuzzi bath. Our Special Deluxe 4 Bedroom Villa, which sleeps 8 people, has a large landscaped garden, with patio and BBQ areas ideal for entertaining. Furnished to five star standards each villa has four gracious bedrooms, two of the king size bedrooms are upstairs and are ensuite. Downstairs is a King Size bedroom ensuite and the twin bedroom. There is a main bathroom with bath. 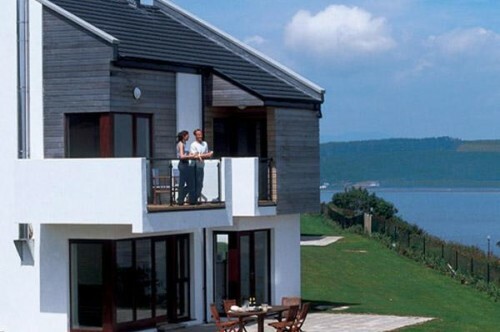 Decked balconies afford panoramic views of Youghal Bay and the Atlantic Ocean. Siematic fitted kitchens, fully equipped with integrated appliances and an American style fridge. The living room has a modern open real fire. Dining room extends to a large outdoor patio, ideal for summer BBQs. Oil fired central heating, satellite TV in all bedrooms and a security system. Deluxe villa comes with towels and linen provided. Unique Penthouse apartment with 2,000 square feet of pure luxury! Stunning 3 bedroomed luxury penthouse with 4 balconies offering uninterrupted views overlooking Youghal Bay and the Atlantic Ocean. Master bedroom has an ensuite bathroom with power shower and it’s own balcony overlooking Youghal Harbour and the town of Youghal. Double bedroom has an ensuite with Jacuzzi bath and walk in shower. 3rd Double bedroom has an ensuite with power shower. All bedrooms have their own TV. Very spacious living room with TV and DVD. 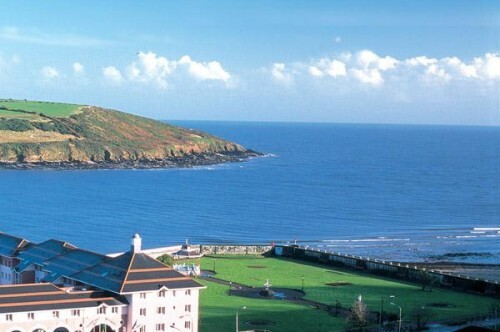 Large L-shaped couch overlooking stunning views of the headland. The dining room has a large table seating 8 people. There is a fully fitted Siematic kitchen, with Fridge freezer, microwave, oven and dishwasher. 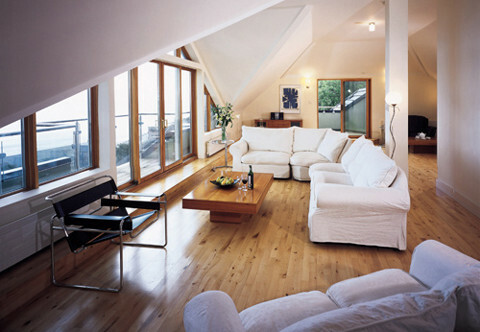 Junkers wooden flooring throughout the Penthouse. We provide bed linen and towels. There is a washing machine, iron and ironing board. 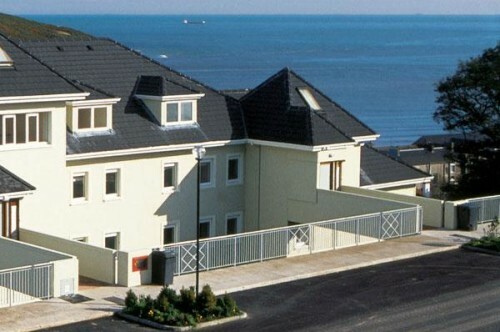 These modern apartments have uninterrupted views overlooking the sea and Youghal Bay. Each apartment is fully furnished to 4 star Hotel standards each with contemporary design and Junkers wooden flooring. There is an open plan living/dining room with TV, DVD player and Hi-fi system. The modern fully fitted kitchens have a washing machine, dishwasher, oven, hob and microwave. It leads on to a balcony with sea views. The master bedroom has a shower ensuite. The second bedroom has 2 single beds and the main bathroom has a Jacuzzi bath.